CIFE prizes are awarded each year to exceptional students and we’re so pleased to report that two of our best have received prizes this year. He Jiayu won the CIFE award for Social Sciences. He Jiayu, better known in Brooke House College as Joyce, attended our institution for almost two years. She arrived at school slightly late, and therefore had to catch up on three demanding A Level courses. Having completed the work, she quickly started to overtake her classmates. She actually found that she disagreed with a lot of what she read; she therefore adopted a confident writing style that challenged and critiqued instead of just described, and obtained grades of Sociology A*, Psychology A* and Chemistry A. She is an exceptional student in many different ways, but it is her independence and individuality as a thinker that makes her an obvious award winner. 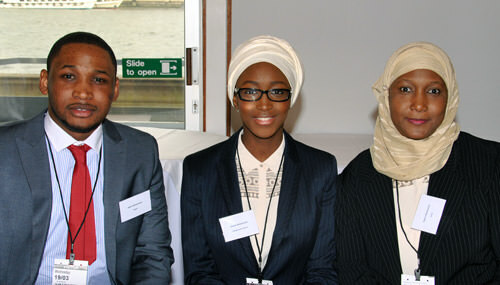 Zainab Mohammed, pictured above with her family at the award ceremony in the House of Lords, won a CIFE college award. Zainab is an extraordinarily ambitious and hard-working student. She takes part in a wide variety of extra-curricular activities from sport to media club to drama. She takes pride in everything she does and sets herself very high standards. In her house, she’s one of the most enthusiastic students and is a natural leader. She is proud of her culture and her faith but she very much enjoys mixing with students from other countries and backgrounds. She is warm and kind and readily gives her time to those in need, both among her peers and in organising fund-raising activities. She works very hard indeed in the classroom and has made a great deal of progress in a short time.